It’s been a while since the Northwest Division has sent anyone to the NBA Finals, but that doesn’t mean these teams aren’t playing some of the best basketball you can find. The Northwest is easily the most difficult division in the NBA with five playoff-caliber teams. Four out of five from the Northwest secured half of the eight playoff spots from the Western Conference last season. And the division’s fifth team, the Denver Nuggets, missed the playoffs by one game. Among the anticipated fights this year — regular season play begins Tuesday — the Utah Jazz and Oklahoma City Thunder will be battling for the top spot in the Northwest. The Jazz knocked the Thunder out of the postseason last year and the Thunder are seeking revenge. The Jazz bring intensity on both ends of the court and their budding star guard Donovan Mitchell is on the verge of a breakout season. But these two playoff threats are only part of dynamics in play. Below is a rundown of what these teams in the Northwest have to offer. The Jazz are the best all-around squad in the Northwest, which is why they are the team to beat. The Jazz boast the defense in the NBA allowing only 98.8 points per game. The D is anchored by center Rudy Gobert. Quinn Snyder’s young team is improving on offense. 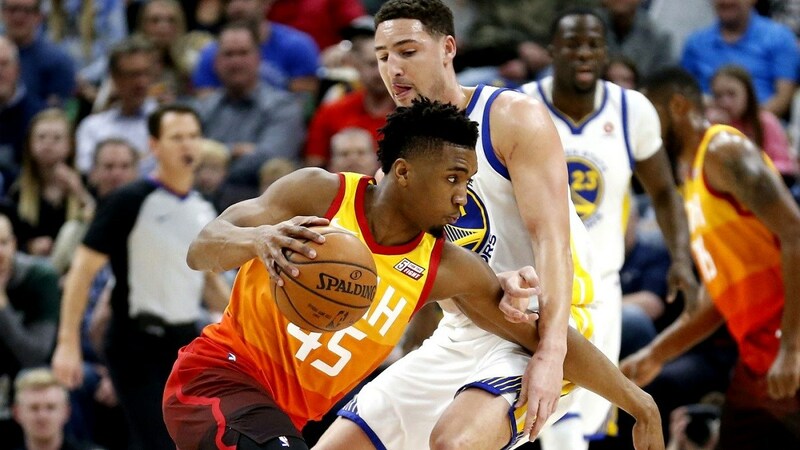 Donovan Mitchell (20.5 ppg) didn�t look like a rookie when he elevated his game in the postseason (24.4 ppg). The Jazz have another potential stud with Australian-born Dante Exum (8.1 ppg). Oklahoma City Thunder fans received amazing news when Paul George opted to stay in OKC, but the Russell Westbrook and Paul George tandem will not be enough to prevent the Jazz for winning the Northwest crown this year. How can the Thunder expect to compete with the top teams in the West, such as the Golden State Warriors and the Houston Rockets, when they’re not even the best team in their division? Russell Westbrook was a one-man show in the playoffs last year (29.3 ppg, 12 rebounds), but he alone could not prevent the Thunder from an early exit in the postseason. The Thunder made two wise moves this offseason. The first was a shocker when Paul George announced he was returning to OKC instead of joining LeBron James and the Lakers. The Thunder’s second smartest move was dumping Carmelo Anthony and his oversized contract, while picking up Dennis Schroder in a three-team trade with Atlanta and Philadelphia. Melo got benched by Billy Donovan in the playoffs and now he’s the Rockets problem. The Thunder made a key upgrade with Schroder over Melo. The Nuggets are on a mission to end their five-year drought. Defense will be their focal point. The high-flying Nuggets were 6th in NBA in scoring last year. Up-tempo style made opponents dread visiting the Nuggets and the thin air of Denver. Nuggets picked up veteran guard Isaiah Thomas in hopes he can add some scoring off the bench, provided his injured hip healed properly. Damian Lillard (26.9 ppg) is one of the most explosive players in the NBA. He’d be a megastar if he played in a bigger market outside of Portland, the hipster capital of the Western world. Lillard with CJ McCollum make up the most dangerous backcourt in the NBA. With the exception of Al-Farouq Aminu, the Blazers played “Ole!” defense last year and gave up 105 ppg, or fifth worst in the NBA. The Blazers game plan was to outshoot, outgun, and outscore opponents. Last season, the Blazers’ offense plateaued in the middle of the pack with only 105.6 ppg. The Blazers have a couple of up and comers with Zach Collins and Anfernee Simons. Where will Jimmy Butler end up? Trade talks with the Miami Heat stalled. It’s a shame that Butler soured on the Wolves, a team on the cusp of greatness. Without Butler, the Wolves will struggle to be a .500 team. Last year, Butler was the best player on a team that looked like they were going to win the division and challenge the Warriors and Rockets for the top spot in the West. When Butler went down with a wrist injury, the Wolves went into a tailspin. The Wolves barely held on to the final playoff spot, but were bounced in the first round by the Houston Rockets.